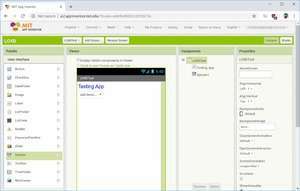 Ai2 Starter is a software download that provides communication between App Inventor running in the browser, and other parts of App Inventor. Also, the program is an Android emulator that provides support for running the App Inventor. Whenever you want to use the emulator or the USB cable, you need to make sure that aiStarter is running. To use the emulator, you will first need to first install some software on your PC (this is not required for the wifi solution). Version 4.6 is a freeware program which does not have restrictions and it's free so it doesn't cost anything. For security reasons, you should also check out the Ai2 Starter download at LO4D.com which includes virus and malware tests. Additional screenshots of this application download may be available, too.